Most people today are looking for the simplest and safest ways to cut down their weight. A good number of people prefer exercising as their way of cutting weight. Even when exercising, dieting can help maximise your efforts? Eating fruits and vegetables can be good for your health. Fruits naturally contain vitamins, fiber and a number of important nutrients that the body needs. However, some fruits fruits contain a lot of fructose sugar. Some fruits are better than others when it comes to helping you loose weight and keep the weight off. Water is very important when it comes to losing weight; therefore, you should regularly take watermelon because water makes up to 90% of the fruit. It also contains arginine which produces amino acids that speed up emulsification. Watermelons keep the body hydrated and manage cravings by keeping you full. Its calories level is also very low. Consider sharing this with others. Please share this on Pinterest! There are studies that have proven that apples should be eaten whole; together with the skin. This will keep your appetite on check and you won’t feel very hungry. The fruit is low on calories and its fiber content is high. Our bodies get approximately one fifth of the fiber it requires when we eat at least one apple a day, hence it can come in handy when trying to lose weight. Consider sharing this with others. Please pin this on Pinterest! Other than apples, grapefruits are also a good source of fiber known as pectin. It is also very rich in potassium, folic acid and vitamin C. This fruit came as a result of crossing an orange and a pamelo. There are different colors for this fruit, like red and pink which are rich in lycopene and vitamin A. Grapefruits reduce hunger and cravings and should be taken before a meal. This way, you will not end up eating a lot of food. A guava does not have cholesterol and has very few carbohydrates that the body can actually digest. It is packed with minerals, roughage and proteins; hence it can help you lose weight without necessarily interfering with your protein intake. In comparison to other fruits like oranges and apples, guavas do not have as much sugar. Most people think of tomato as a vegetable, rather than a fruit; well, it is actually a fruit. Apart from the fact that they do not have many calories, tomatoes help in fighting leptin ,which does not allow the body to lose weight. It contains a high number of antioxidants which are effective in the reduction of water retention. Tomatoes are also known to suppress appetite; hence you will feel full and won’t eat a lot. Consider sharing this with others. Please share this on Pinterest. It is an energy giving fruit and is more efficient than processed energy drinks or energy bars; hence it is best for use before and after working out. Bananas help prevent you from gaining more weight as they have few calories. You will also feel full after eating a banana, which will help control your cravings and appetite as well. This fruit also helps prevent acidity and maintains low blood pressure. 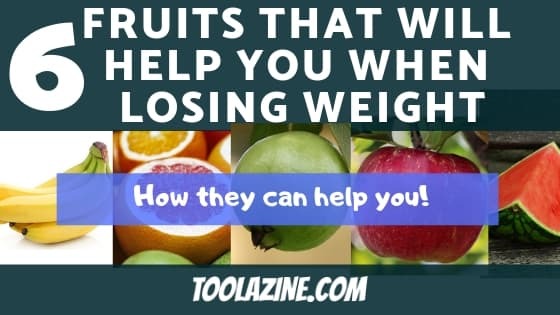 However, it is difficult to lose weight by sticking to a diet with these fruits alone. The entire process will only be successful if the number of calories you consume and the number that your body breaks down are not so far apart. You will be able to achieve your goal by getting rid of meals with high calories and replace them with food with low calories. Furthermore, it is best to combine dieting with exercise for more effective results.